Background & Objective: Traumatic Brain Injury (TBI) is one of the major causes of mortality and morbidity worldwide. It represents mild, moderate and severe effects of physical assault to brain which may cause sequential, primary or secondary ramifications. Primary injury can be due to the first physical hit, blow or jolt to one of the brain compartments. 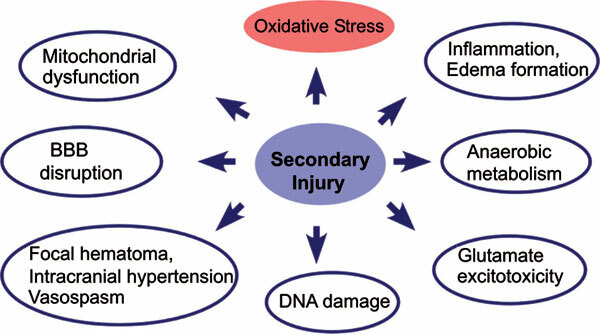 The primary injury is then followed by secondary injury which leads to biochemical, cellular, and physiological changes like blood brain barrier disruption, inflammation, excitotoxicity, necrosis, apoptosis, mitochondrial dysfunction and generation of oxidative stress. Apart from this, there is also an immediate increase in glutamate at the synapses following severe TBI. Excessive glutamate at synapses in turn activates corresponding NMDA and AMPA receptors that facilitate excessive calcium influx into the neuronal cells. This leads to the generation of oxidative stress which further leads to mitochondrial dysfunction, lipid peroxidation and oxidation of proteins and DNA. As a consequence, neuronal cell death takes place and ultimately people start facing some serious disabilies. Conclusion: In the present review we provide extensive overview of the role of reactive oxygen species (ROS)-induced oxidative stress and its fatal effects on brain after TBI. Traumatic brain injury, oxidative stress, glutamate excitotoxicity, mitochondrial dysfunction, secondary injury, biochemical.